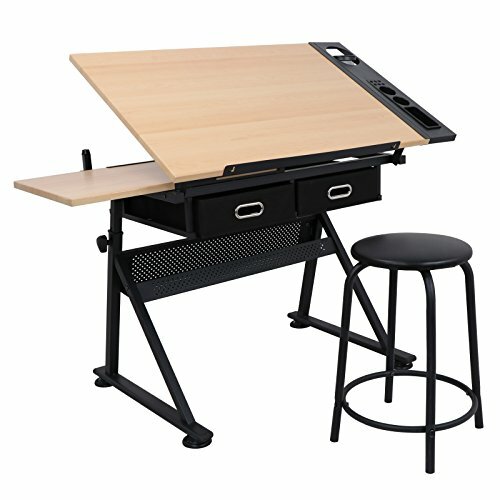 Specially designed for creative use, this drafting table is the perfect workspace for arts and crafts projects, sketching, drafting and more. Its large work surface has one-hand tilt so you can adjust your work up to a 45-degree angle, and there's an additional flat surface that expands your available space. Children can paint and study with this desk at home, in office it can be used as drafting desk. Please Note: all the measurements by hands, please allow little deviations. Thanks for your understanding! If you have any questions about this product by HomGarden, contact us by completing and submitting the form below. If you are looking for a specif part number, please include it with your message.